Feminism in South Africa has been shaped by struggles for political and racial equality as well as by national and transnational struggles for gender equality. Through the country's transition to democracy in the mid-1990s, South African feminism contributed to the process of reconstruction, striving for a nonracist, nonsexist society. However, feminist activism and radical transformational politics were largely diluted in the process. Contemporary South African feminism continues to engage with questions of the role of feminism within broader national and international struggles for class and racial equality. In South Africa, adult white women were given the right to vote in 1930. The first general election at which women could vote was the 1933 election. In 1933, Agnes Bussinné Leila Wright (or Leila Wright), wife of Deneys Reitz, was elected as the first female Member of Parliament. Today, South Africa is ranked among the top five African countries that have high representation of women in the national legislature. According to the South African Revenue Service, South African women earn on average 28% less than men. On August 9, 1956, some 20,000 women held a protest march at the Union Buildings in Pretoria to protest against passes for women. The march was organised under the banner of the Federation of South African Women (FSAW). This day later became National Women's Day in South Africa. After the country's first democratic elections in 1994, many discriminatory statutes in South Africa were scrapped and replaced with the Domestic Violence Act of 1998. According to research on the history of the Federation of South African Women, initially, the struggle of women in South Africa was seen as a two-pronged issue: firstly, the issue of apartheid, which discriminated against nonwhites, and secondly, the issue of laws and institutions that discriminated against women. For several decades, anti-apartheid causes and protests took precedence over gender equality initiatives. Following the abolition of apartheid in 1991 and a transition to multiracial democracy in 1994, more attention was devoted to womens' rights. Some have argued that feminism in South Africa was often associated with white, middle class women. For black South Africans, feminism may often be a highly charged position to take up; it has been seen as a colonial importation, white and middle-class. While there is no peak body organisation for women in South Africa, what passes for the women’s movement is a collection of disparate NGOs such as People Opposing Women Abuse, Sonke Gender Justice and Progressive Women’s Movement of South Africa. Federation of South African Women (FSAW) – a women's group active in protesting discriminatory pass laws aimed at restricting movement of coloured women. African National Congress Women's League (ANCWL) – initially established in 1948 and re-established in the 1990s, aimed at organising women politically and within the African National Congress in particular. Today, the ANCWL has been criticised as being more of a recruitment arm for the ANC. 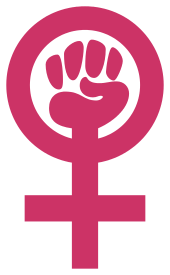 Women's National Coalition (WNC) – established in the early 1990s, with the aim of bringing the issue of gender equality into the public discourse. Progressive Women's Movement of South Africa (PWMSA) – a national women's movement founded in 2006. Jani Allan, media personality, feminist author, animal rights activist. Pregs Govender, activist, author and former Member of Parliament. Anne McClintock, writer and feminist scholar. Elizabeth Maria Molteno, 19th century women's rights activist, particularly active in the women's suffrage movement. Diana E. H. Russell, feminist writer and activist, born and raised in South Africa and currently living in the United States. Olive Schreiner, author of The Story of an African Farm recognized as one of the first feminist novels. Shamima Shaikh, Muslim women's rights activist. Julia Solly, early suffragist and feminist. 1 2 Buiten, Denise. "Feminism in South Africa." The Wiley Blackwell Encyclopedia of Gender and Sexuality Studies. ↑ Steyn, Melissa. "A new agenda: Restructuring feminism in South Africa." Women's Studies International Forum, vol. 21, no. 1, pp. 41-52. Pergamon, 1998. ↑ Frenkel, Ronit. "Feminism and contemporary culture in South Africa." African Studies 67, no. 1 (2008): 1-10. 1 2 3 4 5 "Women's struggle timeline 1905-2006". sahistory.org.za. 1 2 Blee, Kathleen M., and France Winddance Twine, eds. Feminism and antiracism: International struggles for justice. NYU Press, 2001. ↑ Mavuso-mda, Adele. "The Rising Tide of Women's National Coalition: The Experience of South Africa." Global Media Journal 8, no. 15 (2009). ↑ Bauer, Gretchen, and Hannah Evelyn Britton, eds. Women in African parliaments. Boulder, CO: Lynne Rienner Publishers, 2006. 1 2 3 4 "South Africa needs a strong feminist movement to fight patriarchy". The Conversation. ↑ Shimoni, Gideon. Community and Conscience: The Jews in Apartheid South Africa. UPNE, 2003. ↑ Walker, Cherryl. Women and resistance in South Africa. New Africa Books, 1991. ↑ Van Der Merwe, Anita S. "The power of women as nurses in South Africa." Journal of Advanced Nursing 30, no. 6 (1999): 1272-1279. ↑ Driver, Dorothy. "Transformation through art: Writing, representation, and subjectivity in recent South African fiction." World Literature Today 70, no. 1 (1996): 45-52. ↑ Also referred to as African National Congress Women's Section. 1 2 Hassim, Shireen. "Voices, hierarchies and spaces: reconfiguring the women's movement in democratic South Africa." Politikon: South African Journal of Political Studies 32, no. 2 (2005): 175-193.